Celebrate the life and work of Jon Hiseman – drummer, lyricist, songwriter and producer from pioneering jazz-rock band, Colosseum – at the O2 Shepherd’s Bush Empire in London, UK. Tickets start at UK £29 with proceeds going to The Cure Parkinson’s Trust. Support those climbing Mount Kilimanjaro in aid of Parkinson’s by kickstarting their fundraising at this charity ball. A chic champagne reception and polo match is followed by a three-course meal, raffle, auction and live music. Tickets cost UK £75 per person. Raise money for Parkinson’s by cycling through the stunning rural landscapes of south-east Asia. Dotted with ancient landmarks and Buddhist temples, this cycle – organised by travel specialists Discover Adventure – offers a cultural experience like no other. Fundraising targets start at UK £3,650. Get practicing for the annual Leo Geller Golf Tournament at the Boca Rio Golf Club. The day of golfing is followed by raffles, awards and a cocktail reception and dinner. All proceeds will go to the Parkinson’s Foundation. A full day interactive programmes, led by registered speech language pathologists, will focus on overcoming communication challenges – such as disordered articulation, diminished facial expression and impaired swallowing – faced by people with Parkinson’s. Dig out your dancing shoes and spend Valentine’s weekend at this annual event – which will feature live Spanish music and delicious Mexican food – whilst raising money for the Spanish speaking Parkinson’s community in California, US. 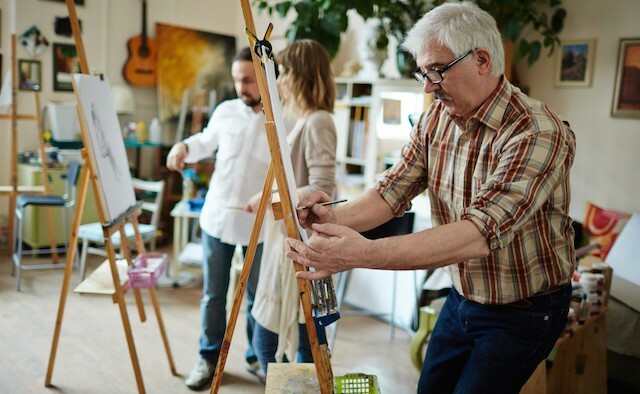 Experience the therapeutic effects of art at this innovative programme for people living with Parkinson’s. Tickets cost AUS $10 and includes morning tea and all art supplies. Challenge yourself to run 50 miles in 50 days – whether that’s at the weekend or on your lunch break – and raise vital funds for Parkinson’s whilst getting fit. Minimum sponsorship is UK £50 and there is a UK £5 signup fee.